Is the process already computerized? For example, if your sales team is not currently using a CRM, then automating the lead generation to sale conversion process may not be a great fit. If they use Excel to track all their phone calls, emails and follow-ups then using robotic process automation to automate will involve multiple steps of evolving the process to computerize it before proceeding further. In this instance, robotic process automation can be used to automate one-time monotonous activities. For instance, reading business cards collected at trade fairs and extracting the information to excel sheet and then sending an email to these contacts. If your process is computerized it will be easier to build a bot to execute the workflow. Imagine a bot that goes through multiple email inboxes for bills received, then automatically processes the bills and posts it to your existing accounting software. With access, it will also be able to make the payment In this case, all that would be left for the human worker would be to approve the payment. This frees up time for the accounting personnel to focus on collections. 2. Is it a high transaction volume process? Implementing RPA comes with a cost. If robotic process automation is a strategic move in your firm, then bots can be deployed from the common platform even for low volume tasks. Right now, most firms are in the experimentation stage. In this case, guaranteed RoI is seen in processes that have a high volume. For instance human assisted chatbots in chat support centers have been shown to increase the capacity of each chat support agent at least twofold. Another high volume process where bots can make a difference is resume processing. Intelligent bots will be able to process and score resumes to identify only the ones that are relevant for the position. Freeing employees from repetitive tasks is one of the basic principles of robotic process automation. Previously, custom built software was required to automate repetitive tasks such as report creation with data pulled from multiple sources. It was more efficient to assign a human to do the report creation task because it might involve logging into multiple websites at specific times and then creating the report. With RPA, the same task can be handled with a custom built bot that would take just weeks to create and train. Once built, the same task can be accomplished in minutes by the bot. This frees the human to attack complex and creative questions. What is the robotic process automation Readiness level of your firm? Stage 1 – Initialization: Is your firm in the experimentation stage of robotic process automation, where you are only trying to understand it and deploy it within existing service contract agreements? 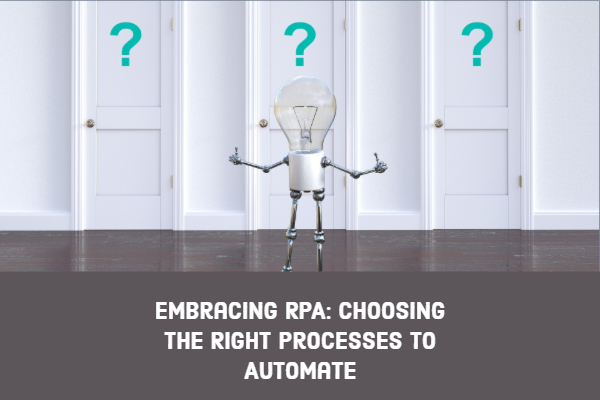 Typically, in this stage, you may still be undecided in making a long-term commitment to RPA and so you would keep it only at the edges of your portfolio. Stage 3 Institutionalization: Globally, very few firms have reached this level. The few who have, show extreme results in traditional productivity metrics such as revenue per employee. When a firm has a long-term commitment to using robotic process automation as part of service delivery and products it creates, it has the ability to change the fundamental business model by improving the capacity of the organization.